to the spectacular Namib Desert, Skeleton Coast and Etosha National Park, incorporating conservation projects for endangered species the Black Rhino, Cheetahs, Lions and Leopards. Meet your Charity host, the safari co-ordinator and the rest of the party and fly to Windhoek. Meet your local safari driver-guides and transfer to the Namib Desert, the world’s oldest living desert. 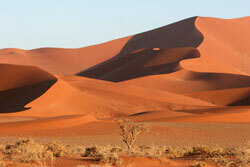 The drive is through some of the most spectacular scenery in Namibia. Late afternoon drive deep into the dunes to watch the sunset. The dunes are reputedly the highest in the world and the photographic opportunities are unsurpassed. There’s also a good chance of seeing gemsbok, springbok, ostriches, pale-chanting goshawk, dune lark and lappet-faced vultures. Early morning sunrise visit to the dunes. Later drive through the Namib Desert toWalvis Bay. Walvis Bay is one of the most important wetland areas along the West Coast of southern Africa and supports over 150,00 birds of 40 species. Late afternoon enjoy a couple of hours birding along the shore and at the freshwater pools where greater flamingos, pelicans and Damara tern may be seen. Morning cruise in Walvis Bay and out to the colony of Cape fur seals at Pelican Point. Schools of dolphins swim alongside the boat and there’s even the chance of seeing southern right whales at this time of year. After lunch drive up the Skeleton Coast to Cape Cross. The Skeleton Coast provides a striking contrast between the desert and the wild Atlantic Ocean, epitomised by dense sea fog and the rusting hulks of shipwrecks. Cape Cross lies in the middle of the Skeleton Coast and is home to the largest breeding colony of Cape fur seals on the southern African coast. The number of seals basking on the rocks and surfing amongst the waves at Cape Cross ranges from 80,000 to 270,000. With the seals come their predators, and you may hear the cries of the black-backed jackals and the whooping calls of brown hyenas during the night. Overnight. Drive inland to Damaraland, a sparsely populated area of highland desert wilderness and home to uniquely adapted desert elephants and the last free-roaming black rhino in the world. Drive to the Save the Rhino Trust camp, which helps to protect and preserves the environment of this endangered species, as well as guarding the rhino with regular patrolling. Afternoon game drive and possibly tracking rhino. The following two mornings will be spent primarily rhino tracking but also observing other species in the area including zebra, giraffe and gemsbok and possibly desert elephant. 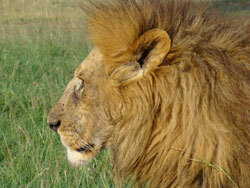 Spend the day relaxing in camp and later in the afternoon enjoy a walking safari or another game drive. Leave Damaraland and drive to Hobatere, a private concession area that borders Etosha National Park in the far west. Hobatere is home to elephant, lion, cheetah, leopard, spotted and brown hyena, gemsbok, eland, kudu, springbok, zebra, giraffe, aardvark, aardwolf, Cape fox and bat-eared fox, as well as being the best site in Namibia forendemic bird species. There are over 300 bird species plus 35 raptors including the rare Egyptian vulture, cuckoo hawks, peregrine falcons and 8 owl species including the pearl-spotted and white-faced owl. The resident ornithologist will ensure you see as many species as possible during your stay with time spentwildlife viewing and bird watching at Hobatere and in Etosha National Park, doingnature walks and night drives. Early morning wildlife viewing or bird-watching session. After breakfast drive through the restricted western part ofEtosha National Park to our camp, which has one of the best waterholes in Namibia, offering rewarding sightings of black rhino, elephant and lion. Wildlife viewing and picnic lunch en-route. Etosha is one of Africa’s greatest parks, with some 144 mammal species including the big five, 110 reptile species and over 340 bird species. Etosha’s elephants are reputed to be the largest in Africa and you should have good sightings of lion, wildebeest, cheetah, giraffe, zebra and possibly leopard. Etosha’s definitive feature is the Etosha Pan, a vast shallow depression about 5,000 sq.km. in size. Etosha is classified as a saline desert, which makes it very different from other reserves in Africa. On some days the pan is a shimmering sheet of mirages where the animals appear to be floating on air. 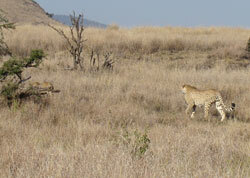 There will be morning and afternoon game drives each day. Drive south to the Africat Foundation that helps to conserve and protect Namibia’sleopards, lions and cheetahs. They house and attempt to re-introduce orphaned, injured and captured carnivores into the wild. Whilst staying at Africat you will have the opportunity to achieve frame-filling portraits of lions, cheetahs and possibly leopards. There is also an excellent hide for bird watching near the lodge. Spend the morning getting close to the animals at the Africat Foundation and may be helping to feed and exercise the cheetahs. After lunch drive to Windhoek airport for an evening flight back to the UK.